Presented by one of the foremost experts in BPM standards, this session will concretely demonstrate usage of the three leading business modeling standards produced by the Object Management Group (OMG). This session will explore the positioning and core behavioral differences between the Business Process Model and Notation (BPMN), the Case Management Model and Notation (CMMN) and the Decision Model Notation (DMN). The specific roles and usage of these dominant business modeling notations will be explained and demonstrated using a worked out example integrating BPMN, CMMN and DMN models. What exactly are BPMN, CMMN and DMN? When is one of these standards best suited for the purpose? 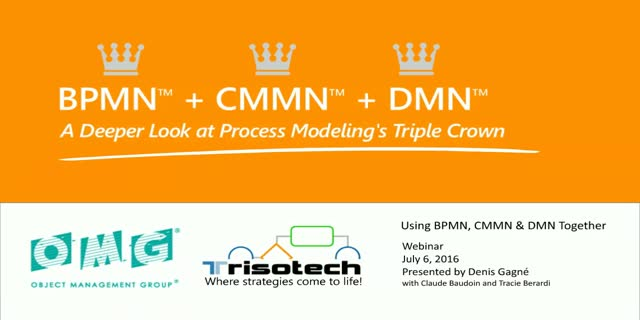 How to use BPMN, CMMN and DMN together? What are the best practices for these standards? Denis Gagné, CEO & CTO, Trisotech. In OMG, Denis is the Chair of the BPMN Interchange Working Group among other roles. Presented by: Denis Gagné, CEO & CTO, Trisotech. In OMG, Denis is the Chair of the BPMN Interchange Working Group among other roles.